Here are eight shoveling safety tips I encourage my patients to follow — especially those with osteoporosis, osteopenia, or low back pain. Wear sturdy shoes that keep you grounded and that allow you to transfer your force into the ground. 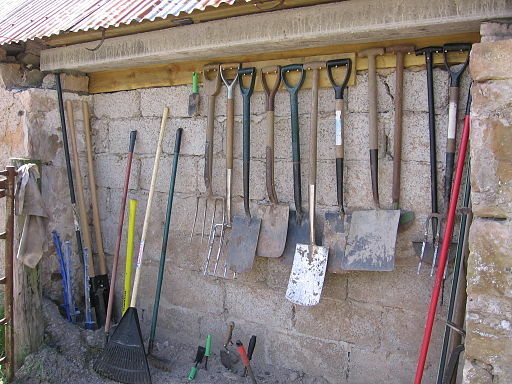 Use a sharp shovel that can penetrate the soil in your garden. Use a shovel that is the right length for you. The shovel handle should be between your shoulder and your hip. That is your power zone. Take the earth or gravel out of the hole with your legs and not your back. Leverage (or offset) the load onto your leg. Keep the load close to your body as you move the shovel. When moving in another direction, move with your feet and do not rotate. I want to cover eight shoveling safety tips when you move plants, re-establish gardens, or replant things. This is the advice that I give to many of my clients. Sturdy shoes that allow you to transfer your force into the ground is really one of the first key things, and then a sharp shovel. Use a shovel that is the right height for you. I’m just under five-two, and so this short-handled shovel is perfect for me. However, for my taller clients, I would certainly recommend that they use a longer handled shovel so that they can get up and behind the shovel. Because I’m not that tall, I want to resort back to the shorter shovel here, but you can imagine anybody over five-seven using a shorter shovel. They’re going to end up being in a position where the shovel is below the height of their hip. Again, you’re not wanting that, because you can’t get your body weight over the shovel. The handle of the shovel should definitely be below your shoulder, but above your hip. That is in your power zone. Once you’re down into the earth and you create your hole, then taking the earth out, or shoveling, whether it’s earth or whether it’s gravel with your legs more so than just with your back and your arms. If I was going to do back and arms, my legs would be pretty straight, and I would bend from the back and use my arms. With time I would, maybe, not feel it that day, but certainly feel it the next day, or pay the consequences on the effect that it would have on my bones or my discs. Let’s review how to do it in a safer manner. Once you’ve gone down, use your legs, and again, if it’s a really heavy load, even offsetting some of the weight onto your thigh as you’re coming up. Then keep that load as close as possible as you move your load. If I was going to be moving this in another direction, I would want to always move my feet in the direction that I was going to drop the load in, as opposed to just taking it and rotating from the body because that’s going to be a lot more harmful on your back. That covers shoveling safety tips for your garden. I am concerned about the best way to manage luggage when traveling.Whether using carry on luggage or checking bags,there is still lifting involved. I recently had an MRI which showed osteoarthritis,disc bulging and nerve inflammation,worse at L4 and 5. I recently used carry on luggage,but the airline flight attendant would not assist in lifting it. Hi Maxine, Great question. In most cases if you take a carry on that is just a little too big they have you leave it with the baggage crew just before you board the plane. It is then delivered to you as you exit the plane. It takes a few minutes longer than bringing your carry on onto the plane but there is no lifting involved. Safe travels!